Well I’ll explain it for you. Sidenote: I gotta new gig. I’m weekly news correspondent for Inman News. Most of the videos will be agent focused, so I didn’t want to bore my blog readers, which are mainly home buyers and sellers. But this video transcends. Upcoming Post: I Just Bought a House, and NO I didn’t get a Good Deal. Make sure to subscribe via email to my not too frequent posts. See what you’re trying to get at, but 1099 isn’t the way to go. That system will simply give the agent/investors, who may rarely, if ever, perform the functions of real estate agent for customers the award. … and will definitely put the new guy at a disadvantage. — who is more interested in their customers’ needs than snagging some meaningless award. If there was a way to get customers to vote with out opening the door for agents to pad their numbers (because they will), that would be the only remotely meaningful number. Keep up the good work, Frank! I think I’m #1 at watching you talk about being #1 and wasting this beautiful Sun. morning waiting for your airbag to blow up in your face! lol.. Well not really but that would be funny as hell. Wouldn’t the 1099 award always end up going to some broker in LA, manhattan, or honolulu? If all goes smoothly soon, soon we will join you in your mortgage-debt-dom. REAL agent reviews is where it is all headed. Redfin does an amazing job of this. Your idea is not unique. 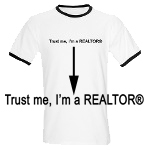 The RE/MAX model has been using it for as long as I have been affiliated with them. All the RE/MAX awards are based on commissions earned. Personally, I think the thought process should go a step further and factor in commissions kept! Not everyone runs a profitable business! Yes my ideas are rarely unique. I like to copy everyone. I like that idea (probably unique) to focus on profits. Maybe everyone can turn in their tax returns. Whoever pays Uncle Sam the most (for residential real estate stuff) wins. What kind of camera do you use on your wheel? I’ve enjoyed watching you. It changes each time. Watch my video over on Inman comparing each of these super wide cameras. So what does it mean to the Consumer when an Agent makes the most commissions in one year? What does that mean for the Consumer. Is it relevant? I have no idea where to begin to find a good real estate agent that actually knows what they are doing. Any recommendation for me? I want to find a home in somewhere in Centreville, Herndon, Reston, or Chantilly. Thanks!